Dar was indicted by the accountability court last month , less than 48 hours after he received a copy of the reference filed against him. The Islamabad High Court (IHC) on Tuesday dismissed a second application filed by Finance Minister Ishaq Dar against his indictment by an accountability court in a corruption reference pertaining to ownership of "assets beyond his known sources of income". A two-judge division bench, comprising Justice Athar Minallah and Justice Miangul Hassan Aurangzeb, had reserved the verdict on the petition on October 11 after completion of arguments. 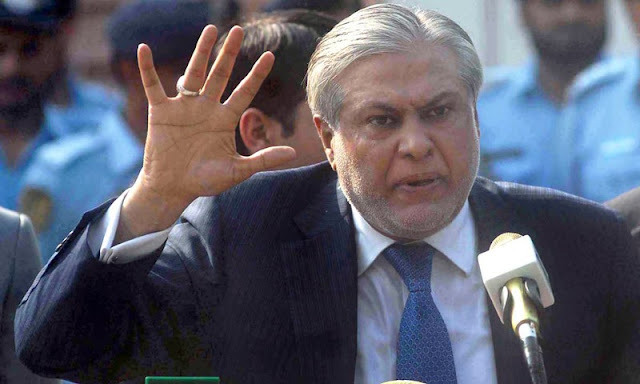 Dar was indicted by the accountability court last month — less than 48 hours after he received a copy of the reference filed against him by the National Accountability Bureau (NAB), along with copies of related documents spanning 23 volumes. The minister's lawyer said that he would approach the Supreme Court against the high court's decision. "Islamabad High Court did not even hear our stance," said Advocate Abdul Rehman, adding that it was Dar's constitutional right to fulfil constitutional obligations. Earlier this month, the IHC had rejected Dar's first applicationchallenging his ‘swift indictment’ by the accountability court in the assets reference. The petition submitted by Dar's counsel, Khawaja Harris, had maintained that the accountability court had not granted him a minimum period of seven days to peruse the material that the accountability court had handed him two days before his indictment. NAB filed three references against former prime minister Nawaz Sharif and his children and one against Dar on the directions of the Supreme Court on September 8. On September 18, NAB Lahore wrote to the State Bank of Pakistan to remind them that since a reference was pending against him, “the bank accounts of Dar may be cautioned”. The bureau, however, left room for transactions from these accounts, as NAB has made this subject to the orders of the accountability court. NAB had also written to district governments, asking them to stop any transfer or disposal of the properties owned by Dar, warning that in case of non-compliance, they could face up to three years in prison under the National Accountability Ordinance. The Islamabad High Court (IHC) on Tuesday dismissed a second application filed by Finance Minister Ishaq Dar against his indictment by an accountability court in a corruption reference pertaining to ownership of "assets beyond his known sources of income". A two-judge division bench, comprising Justice Athar Minallah and Justice Miangul Hassan Aurangzeb, had reserved the verdict on the petition on October 11 after completion of arguments.